Strictly from the personal prospective, 2017 wasn’t a bad year: it had its share of unpleasantness and hardships but nothing to be really unhappy – so I won’t complain or even mention that. Instead, I would rather remember that year by good things that happened – short and long trips, wonderful time spent with my friends, successful projects at work and wonderful perfumes I got to test and wear in 2017. As I usually do it in the beginning of the new year, I’m looking back to my perfume records and sharing with you my insights. 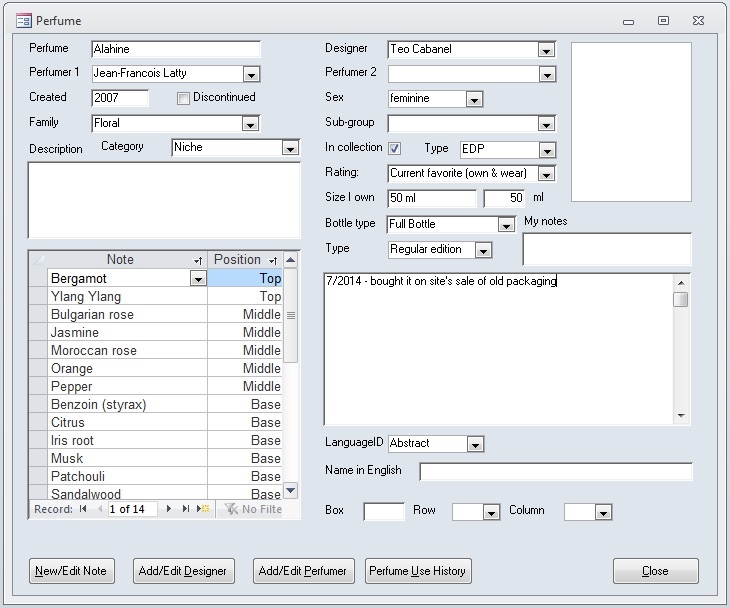 Years ago I created a personal database (using MS Access) to hold information on all the perfumes I own or test. Whenever I get a new sample, I add it to the database – below I give an example of the entry form I use. I do not always get all the information but I add what I can find. Perfume name, launch year and notes are free-text entry; designer (brand), perfumers, notes and some other data points are coming from the pre-defined lists, so there can be no discrepancies. Whenever I wear or test perfumes, I record it in the Perfume Diary. 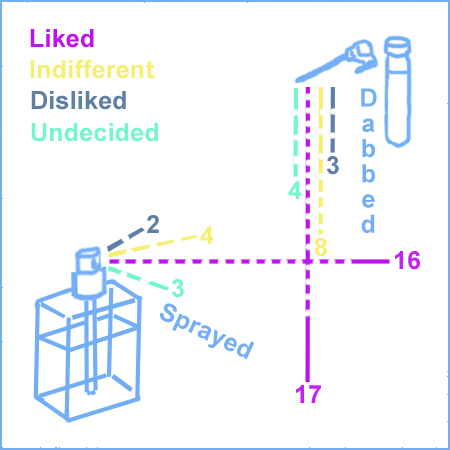 In the form below, “Purpose” is one of the choices for when/why I wore or tested that perfume, e.g., “office wear” or “weekend day” or “Work from home.” Type of use is either “wore” or “tested”; “Response” is a formalized evaluation of how I reacted to that perfume on that day – e.g., “Enjoyed it a lot” or “Mixed feelings” or “I hated it,” etc. And finally “My notes” contain a short free-form comment, whatever I want to write about that time I wore or tested perfume. For those readers who haven’t been around when I was doing this series regularly, I want to explain what I mean when I say “tested” or “wore”: for testing I apply perfume to one area on my arms easily available for the repetitive sniffing. I can test two, sometimes even more perfumes at the same time. I do most of my testing in the evenings or while working from home. When I wear perfume, I apply it to at least three-four points, and usually I plan to spend at least 4-8 hours with the same scent so I’m prepared to re-apply if the original application wears off. After wearing a less tenacious perfume in the morning I might wear another one later. I wear perfumes mostly from bottles and decants; I wear perfumes from samples only when I consider buying a bottle or decant. So, now when I explained how I collect data, let’s take a look at my 2017 in numbers. This year I wore more different perfumes than the year before – 178 (vs. 164 in 2016) from more brands – 72 (vs. 61) but did it less often – on 314 occasions (vs. 333). Second year in a row Jo Malone was a brand I wore the most. I think it’s because these are my most “office friendly” perfumes. Neela Vermeire Creations made its way back into the Top 10 chart (last time it was here in 2014); while Le Labo fell completely off. 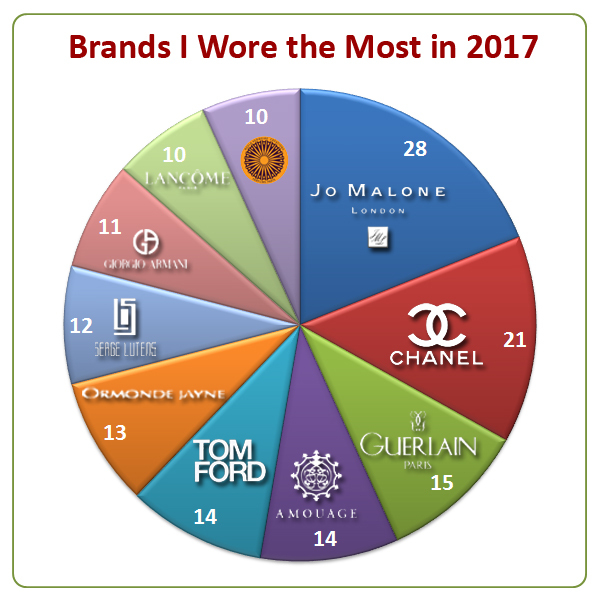 The rest of the group just moved around but stayed on the chart, which isn’t surprising since I do not either update or expand my collection significantly any longer and keep wearing my favorites. I tend to rotate perfumes I wear daily so I usually do not wear the same perfume even twice the same months – that’s how I go through that many different perfumes in a year. But I still managed to wear 67 perfumes more than once during 2017. 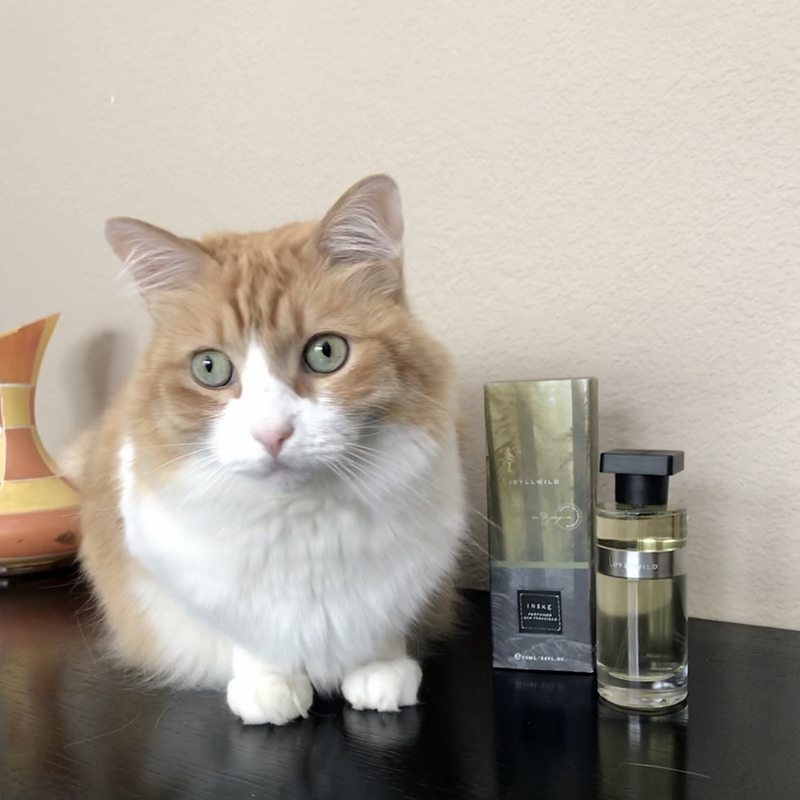 Five perfumes I wore the most – Chanel No 19 (EdT, EdP and extrait), Lancôme Climat, Ormonde Jayne Ta’if, Krigler Lieber Gustav 14 and Armani La Femme Bleue. This year was remarkable in regards to testing: in addition to the cursory testing of about 1,000 perfumes during my London – Barcelona – Stockholm trip (those didn’t go into my database – unless I scored a sample to bring back with me), I recorded testing at home 300 perfumes (vs. 275 last year) from 103 (vs. 100) brands. 134 of them were completely new to me (the rest I had tested before). I really liked/loved 24 of them, liked 20, thought that 56 were just not interesting and disliked 34. Out if the 134 new for me perfumes that I tested, only 45 were released in 2017. Two of the 45 I liked enough to buy – Ineke Idyllwild and Sonoma Scent Studio Bee’s Bliss. Has any of the 2017 releases joined your collection?